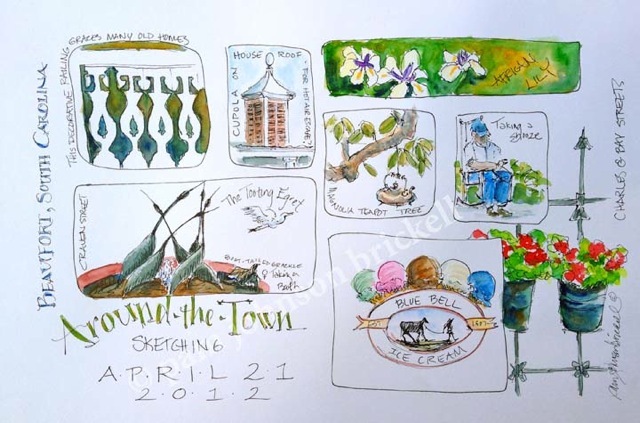 Back in April, I conducted an Around-the-Town Sketching Workshop in Beaufort for Coastal Art Supply. 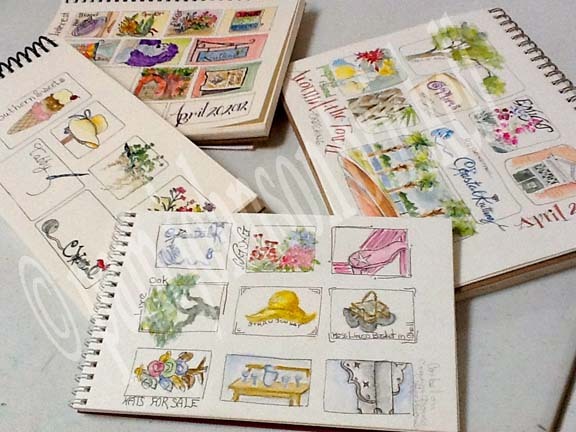 On the first day, we started by drawing small boxes of various sizes on a page in our sketchbooks. 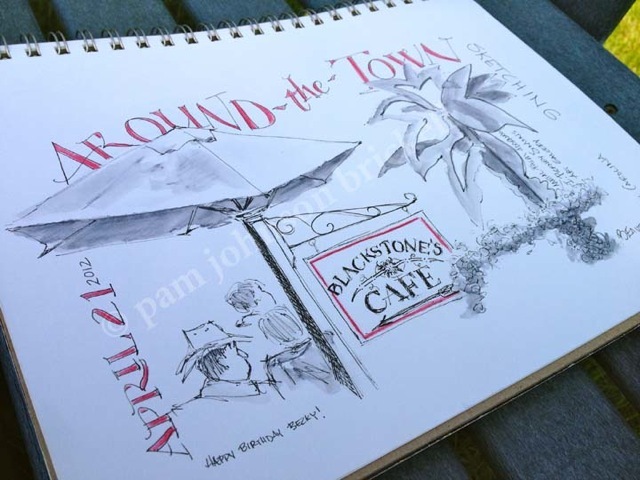 Then we headed outside with just our Micron pens, pencils and sketchbooks. 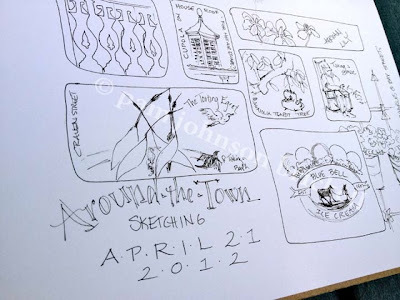 My goals for the students included learning how to sketch quickly, how to make color notes and in the end, completing their pages with color and decorative lettering. We started filling the boxes with 30 second and 1 minute sketches. Sometimes we splurged and stayed in one spot for 5 minutes. 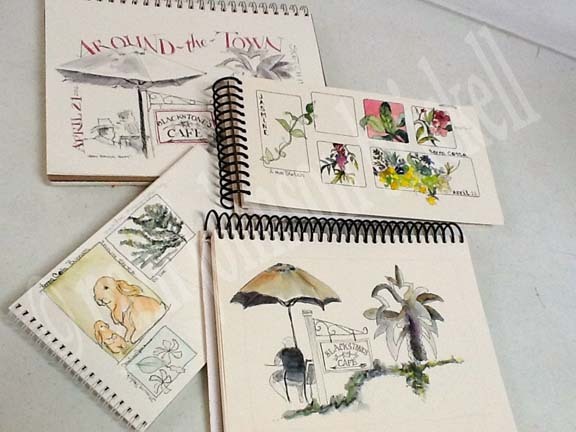 After lunch we'd work in the studio and finish our morning sketches using watercolors or watercolor pencils. Check out these results! The second day, we approached our journal pages differently. We used multiple images to create flowing vignettes on a single page. I picked the subjects and taught them how to decide where to position each item on the page. This is my demonstration page. The first item drawn was the metal palm tree sculpture on the right side of the page. I chose that spot because of the strong design of the fronds that pointed to the left - and into the center of my page. The second element was the umbrella with the people. Note that the shape of the umbrella points into the center of my page. And the people are facing right, into the page. The third element was the cafe sign. I made it a size to tie into what was already on my page. The type was added back in the studio. The page was screaming for a border.... type is perfect for that. After lunch we hit the streets again with another page of boxes - they were a big hit and perfect for quick sketches.... and, what a flavor of Beaufort we captured!! Great post, Pam! Would have loved to have taken this class. Gorgeous work from everyone too! Thanks, Linda! Yes, the boxes really help you lighten the load so to speak. I love that you can go at your own speed to finish the page. Lucinda Hathaway....Longboat Key ..... Too far away! Ha, ha Cinda. Nearly killed you with the handmade box didn't I :) Thanks for the plug! I look forward to seeing you in Beaufort again. Your pages always sing! Looks like a terrific class with inventive ideas. I'll see if I can incorporate one or more into my own work. Thanks so much for sharing, Pam. Excellent post! I' a big fan of boxes! Great work from all. Very interesting idea and makes for very interesting pages!! !